The Empire style was deliberately propagandistic, and embraced what was most monumental in ancient art as suitable analogies to the new French Empire. Napoleon imposed a tyrannical centralization on artistic production, decreeing that it would be subject to control from Paris and overseen by the architects Percier and Fontaine and the painter Jacques-Louis David. The former nobility was now impoverished or in exile. The new elite owed its fortune and glory to a master whose predilections it imitated shamelessly. The result was a style whose spectacular success and uniformity was unprecedented in France. Furniture: Dominated by Greco-Roman models, the Empire style - spare, noble, massive - had a studied dignity consistent with Napoleonic majesty. The characteristic furniture types were a bit stiff but imposing: their flat surfaces and sharp corners, together with their lack of moldings, produced an effect of grandeur that was not without beauty. 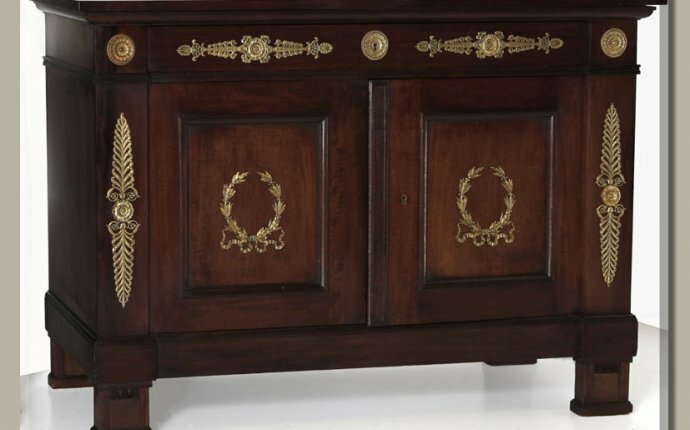 Furniture maker George Jacob dominated the Empire style. Several new pieces of furniture, such as boat beds decorated only on one side, " the office "Minister" desk, and "psyche" mirrors became widespread. The most characteristic Empire tables are round, massive versions of the gueridon type and frequently served as dining tables. Seating was usually made of mahogany, was heavy and the backs were always upholstered. Small pieces conceived for precise purposes, became rarer. Console tables were rigid and solemn, usually rectangular, with marble tops resting on thick friezes decorated with bronze fittings, while it's four legs rose from heavy bases. 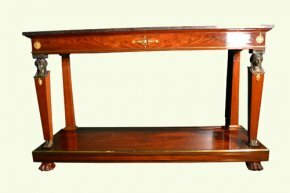 Materials and techniques: Mahogany was the wood of choice. When it became unavailable due to a blockade, walnut, burled elm, beech, ash yew root, boxwood, olivewood and maple was used. Bronze fittings were placed symmetrically on flat surfaces. Marble tops had sharp corners and were most often gray or black, but white marble tops were sometimes used. Ornament: Ornamentation was marked by rigorous symmetry. Motifs associated with this rule are the eagle, bee, stars, initials I and N, which were usually inscribed within an imperial laurel crown. Figures of victory bearing palm branches, swans, lions, rose wreaths, climbing grape vines, flat acanthus leaves, Egyptian motifs and geometric shapes such as circles, squares, octagons and ovals were widely used. @John Self: The antique desk-drawers are easy on Airtrack, Slick? A spliff, a pad and turned. @Rhinestones & Rust: "New" Piece: Very nice antique chest of drawers made by Abernathy Furniture Co.